Chelsea visit Huddersfield Town on Tuesday, trying to bounce back from Saturday's shock defeat at the hands of West Ham. Don't miss our Huddersfield vs Chelsea betting preview with predictions, betting tips, probable lineups, team news, best odds, exclusive free bets and no deposit bonuses on midweek's matches! 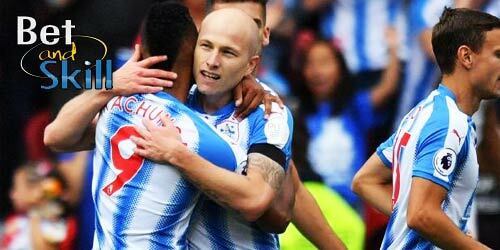 Huddersfield ended a four-match losing streak, beating Brighton at the weekend to rise to 11th place in the standings, five points above the bottom three. The Terriers are a tough team at the John Smith's Stadium. In the last three home encounters prior to the Brighton match, they have defeated Man UTD and West Brom and led at half-time against Manchester City only to concede a late winner to the runaway league leaders. David Wagner's men have scored in all but two of their home games this season as well. Steve Mounie should retain his place up front after scoring a brace at the weekend, with Laurent Depoitre viable alternative should David Wagner continue his rotation policy. Rajiv Van La Parra has completed a three-match ban and looks set to replace Collin Quaner, forming a trio of offensive midfielders alongside Tom Ince and Elias Kachunga. Kasey Palmer is ineligible to face off against his parent club while Michael Hefele continues to overcome an Achilles injury. The likes of Phillip Billing and Jon Stankovic remain out. Chelsea will be desperate to getting back to winning ways as they suffered a 1-0 loss at West Ham on Saturday's lunch-time kick-off. That result ended a 7 match unbeaten run in Premier League (W6 D1). This followed their 1-1 draw at home to Atletico Madrid last week, which saw them fail to take the top spot in their Champions League group. Antonio Conte said after the game that Chelsea's Premier League title defence is now over as they trail Man City by a whopping 14 points. The Blues are currently third in the table at a 3 point distance from second placed Manchester UTD and have only won two of their last five away from home in the league. The Blues will be without David Luiz, Kenedy and Charly Musonda. Danny Drinkwater also remains a doubt but he is expected to replace Tiemouè Bakayoko in midfield. Victor Moses will feature from the off as righ wing back, with Davide Zappacosta making room. Pedro is also likely to start, meaning that Antonio Conte will switch to a 3-4-2-1 system. Alvaro Morata and Eden Hazard will retain their starting berth up front, as Michy Batshuayi is still lacking match fitness.